Carolina Drumworks is an independent maker of fine snare drums for the discerning performer. Unlike a typical custom drum company, we build our drums according to our acoustic, design and aesthetic standards, working with the customer's goals of sound and us. Our inventory instruments are then made available for purchase, or we can custom build to order within those standards. Every Carolina Drumworks snare is individual and unique because of our designing and handcrafting process. We create all our drums on the principles of top quality components, respect for the materials, and exceptional performance capabilities. At every step of the way, from shell design to hardware specifications to bearing edge selection, decisions are made to enhance the player's experience and the performance of each drum individually. Not every drum is ideal for every player or every musical style. Our aim is to provide you with your "go to" drum for your personal and professional needs. With that in mind, we select the best shell, the best features and the best capabilities to give you the optimal tool for your performance craft. 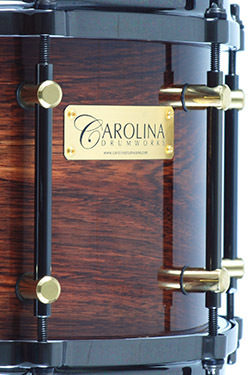 Carolina Drumworks acoustic designs are based on principles derived from timpani and mallet percussion, as well as many aspects of rock and jazz drum legacy, and from sonic characteristics applied to musical instruments in general. So these snare drums give you the range, tone and integrity of sound and structure that allow you to perform at your best, bringing your energy, skills and musicianship to the very top surface of your performance. We think you'll find the instrument for you.